Germans on Tuesday expressed alarm after two days of violent far-right protests that degenerated into attacks against foreign-looking people. After the fatal stabbing of a German man, 35, allegedly by a Syrian and an Iraqi, thousands of protesters marched in the eastern city of Chemnitz for two straight days, some chasing down people they believed were immigrants. The ugly scenes of mostly white men, many of them extremist football hooligans, hurling abuse at people they deemed to be foreigners, have drawn comparisons to pre-Nazi Germany. “Of course history is not repeating itself, but that a far-right mob is on a rampage in the middle of Germany and the authorities are overwhelmed, is reminiscent of the situation during the Weimar Republic,” said Spiegel Online. Chancellor Angela Merkel condemned the violence, saying “hate in the streets” has no place in Germany. Police reported assaults by extremists against at least three foreigners on Sunday, while investigations were opened in 10 cases of the protesters performing the illegal Hitler salute. At least 20 people were injured on Monday as pyrotechnics and other objects were hurled by both far-right demonstrators as well as anti-fascist counter-protesters in the city. 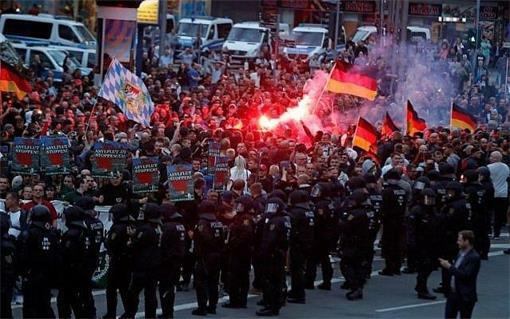 Saxony’s interior minister Roland Woeller said hooligans from across Germany, including as far as the western states of North Rhine-Westphalia and Lower Saxony, had travelled to Chemnitz for the marches.